The Cubs insisted Wrigley Field would be ready for the home opener April 10, even though this is what it looks like now. RIVER NORTH — The Cubs' rebuilding process might be complete with their players, but renovations continue at Wrigley Field as part of the $550 million, multiyear 1060 Project. Team President Crane Kenney said Saturday that before the team defends its World Series victory this year, "We need to put our ballpark back together." At the Cubs Convention Saturday, Kenney said, "We're running at an accelerated clip to get the ballpark ready for our home opener April 10." Kenney and Carl Rice, the team executive in charge of the 1060 Project, named for the ballpark's Addison Street address, pledged it would be ready for play, even after they gutted the field and area beneath home plate to put in a new high-end stadium club and concession stands under the grandstand. 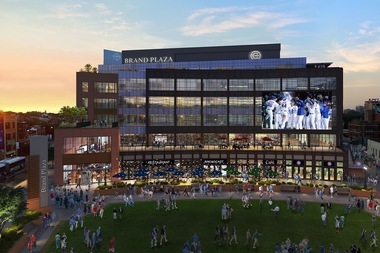 The second year of construction at Wrigley Field includes major work on the plaza and office building that will have first-floor retail and dining. The concession stands might not be open until May or June, Rice said, but will offer a new array of foods. The 1914 Club will follow in 2018, with other stadium clubs down the first- and third-base lines and in the upper deck after that. Cubs Chairman Tom Ricketts said at the team's fan convention Saturday that the plaza, long touted as a new focal point outside Wrigley Field, would be fully ready next season. "Maybe not Opening Day," Ricketts said, "but over the course of the summer." A new admission gate on the west side of the stadium is part of the construction and should ease entry and exit from Wrigley for fans. Ricketts acknowledged, somewhat playfully, that the team's extended playoff run through the World Series had "definitely cut into our construction time. But it's all good," a point echoed by Kenney and Rice. 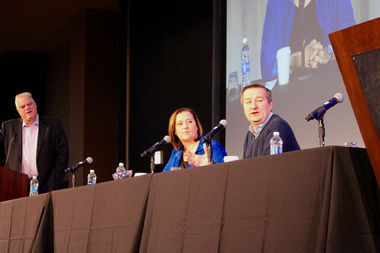 A multitude of topics, including the 1060 Project, were addressed during sessions at the Cubs Convention, with the Ricketts family in the morning and team business executives in the afternoon. 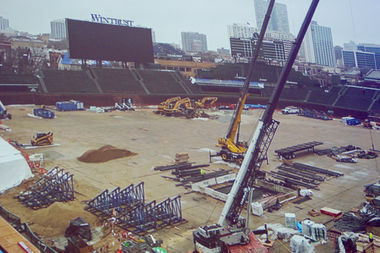 Ricketts said that Wrigley Field is "all torn up, like it is every off-season" as the team continues with the 1060 Project to renovate the park. He added that they're again "replacing steel and concrete that's been there 100 years," but said he expected it to be ready for the season, and that the reconstruction would ultimately lend itself to 40 percent more bathrooms and eight more elevators. Rice said they'd eventually have 11 elevators at the park, including "sub elevators" from level to level. "We are sensitive to that issue," Ricketts said in regards to making the historic older stadium accessible to fans with disabilities. According to Ricketts, the Cubs will raise their 2016 championship banner before the home opener, April 10 against Los Angeles, but the ring ceremony for the players will take place the next game, April 12. Kenney announced that the team would be conducting a "Championship Ring Bearer Fan Contest," allowing 20 fans to present rings to players on the field. Fans must record videos under a minute explaining why someone they know deserves the honor, then tweet those videos on Twitter with the hashtag #CubsRingBearer. "Judges will be looking for fans who express authentic passion and enthusiasm for Cubs baseball," according to a team news release. The contest is already underway and runs through Feb 14, the day pitchers and catchers are scheduled to report to training camp. Kenney said the team continues to push for the closing of Clark and Addison streets before and after games over terror concerns following truck attacks on pedestrians in Europe. He drew parallels with the barriers put up at the Christkindlmarket, even though Mayor Rahm Emanuel has been resistant to the idea thus far. Alex Sugarman, the Cubs' vice president in charge of ballpark operations, called it "an unfortunate reality" that the team needed to be vigilant, adding, "We still believe long-term that's the answer for us." Kenney said dialogue with city officials was ongoing and "the conversations have gotten more real." One casualty of this year's reconstruction will be the on-field bullpens, to be moved from the foul lines to beneath the bleachers. "We've got to," Ricketts said. "I know it's not popular. I like the bullpens where they are." But he stressed the move was a safety issue for players tripping over the bullpen mounds. Kenney agreed, saying the move was made "with the best interests of our players and their safety." Ricketts acknowledged plans to bring football and perhaps a college bowl game to the park, saying, "We intend to bring football back to Wrigley," where the Bears played for decades before moving to Soldier Field in the '70s. With WSCR-AM host Mike Mulligan in the background, Laura and Tom Ricketts discuss continuing improvements to Wrigley Field at the Cubs Convention. But he said football would have to wait until the 1060 Project reconstruction was complete. A Northwestern game already is set for 2020. Kenney said that the team would try to bring the All-Star Game to Wrigley when the renovation is complete, but Major League Baseball tends to assign the game to cities with publicly funded stadiums as something of a reward. He called the policy "a little bit of a hurdle" the Cubs were intent on overcoming. The Cubs are close to reaching a deal with MLB to allow streaming, Kenney said, and the team still is thinking of forming its own TV network when its current deals expire in 2019. It would still use a main broadcast or cable partner, he said. "With our ratings, we've been very active in conversations" with possible partners, Kenney said. Ricketts said the team was working persistently to address scalpers and ticket brokers gobbling up seats, even as season ticket holders, primarily to sell them at a profit. "It can be a problem at times," he said, citing the $10,000 prices set for some seats during the World Series. Ricketts said the team monitors its database of season ticket holders and "we try to weed those people out" by removing them. Colin Faulkner, vice president of sales and marketing, said the lucrative resale market created "an incentive for people to commit fraud," something the team found "disheartening" in turning away fans with printed tickets that turned out to be phony. For that reason, he said, the Cubs will phase out print-at-home tickets this season in favor of a Major League Baseball ticket app. Co-owner Laura Ricketts lauded fans for the $2 million raised this season in the 50-50 raffle at games, with $4 million overall raised last year by Cubs Charities. A persistent theme at the convention was the Cubs thanking fans for their patience over the years on issues such as lights, rooftops, video boards and the Wrigley reconstruction, just as the fans were thanking the team for last year's world championship. "We're standing here today with a World Series trophy," Kenney said. "It makes us feel better about some of the things we've taken on."